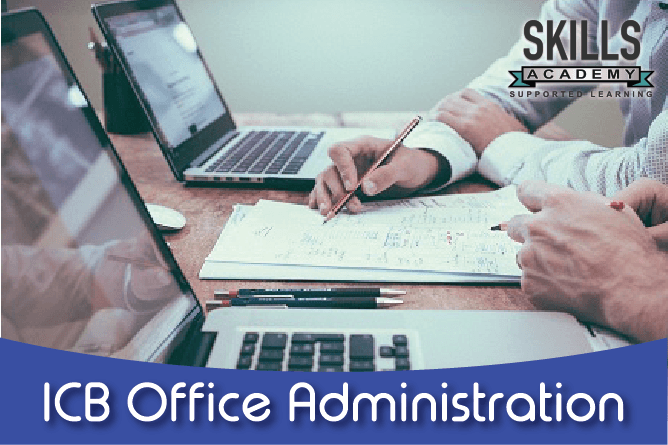 You’ve wondered “What is Office Administration?” but there is so much information out there that it can be difficult to sift through it all and find just what you need. This article will give you all the information you need to understand what Office management is all about. An 18-month certificate course that qualifies you to be a Junior Office Administrator. This course only requires you to have a Grade 12 certificate to start. To complete this course, students will have to complete all the modules from the ICB National Certificate: Office Administration course. A 28-month certificate course that will qualify you to be a senior Office Administrator. Entry requirement for this course is the ICB Certificate: Office Administration. Office admin is the daily tasks done in an office to make sure operations run smoothly. They could be preparing and scheduling meetings, bookkeeping, record keeping, and so much more. Office administrators are valuable in a business. They help with the flow of things and keep track of everything (invoices, deadlines and meetings). Office administrators could also be responsible for supervising some employees, providing them with tasks to complete. Office Administrators are important to every company. They help to make sure that the day-to-day workings run smoothly. They perform a lot of different tasks to make sure everything is on track. What are Office Administration Duties? Coordinating activities in the office to make sure they obey company policies. Managing the admin staff and delegating work. Making sure the office has all the supplies it needs. Ordering the supplies that the office needs. Helping all staff whenever possible. Tasks like these need to be done properly to ensure that the office environment runs smoothly. Office Administrators also need to be skilled in things like time management and record keeping. What Skills Does an Office Administrator Need? having a high level of skill in the different software programs that you will use such as the MS Office suite. As you can see, these skills are essential to being able to effectively perform all the duties that are expected of an Office Administrator. However, you might be wondering what some of those skills actually mean so let’s take a look at them in a bit more detail. This is simply paying attention. An office administrator works with many different people and a huge amount of information. This means that you need to be very careful and precise when you write down or enter information, catching mistakes like typos in emails and documents before they get sent out, and making sure no detail is left out of an email, memo, or a report. If you don’t do this it will create a very bad impression of you and of your company. This is the ability to make sure that your superiors and colleagues have what they need when they need it without needing to ask. To do this all you really need to do is pay attention to what is happening around you. For example, you know that when there is a meeting there needs to be water and glasses in the meeting room. So instead of waiting until you get asked to bring it, you make sure it is there when people first enter the room. You will order supplies that are needed before they run out. Small things like that not only make everyone’s life easier but they also help the office run more smoothly. As an Office Administrator, you will have a lot of tasks that need to be done every day. However, you will also be given unexpected tasks. These will need to be done as well as your normal day-to-day responsibilities. You need to be able to plan and manage your time well to make sure everything gets done. This is not always easy but that is why time management skills are so important. Every day as an office administrator will bring you new and different challenges. No two days will ever be the same. You will need to be able to adapt to any situation and challenge that comes your way. If you aren’t flexible you won’t be able to do what needs to be done. In any office, there are processes and procedures in place that explain what to do in most situations. However, what do you do when something unexpected happens or the normal processes and procedures won’t help? For example, maybe you need to print documents for a meeting later today but the printer is broken. You call the repairman like usual but he tells you that he will only be able to come and fix it tomorrow. What do you do? Sometimes you will need to think creatively or “outside the box” to achieve your tasks, fix a problem, or perform your responsibilities. This is why you need to be resourceful. These skills might not seem very important but they are some of the most important skills that employers look for when they want to hire someone as an Office Administrator. Yes, you can. There are many different places where you can study Office Administration. You can do full-time, part-time, and even distance-learning courses. One of the most popular options is doing it through distance learning. You can find out more about the advantages and disadvantages of distance learning by reading our ICB Distance Learning Courses article. All three courses and several other ICB courses are offered by Skills Academy. You can see all the ICB courses that Skills Academy offers on the ICB Courses page. These courses are designed to give you a high level of skill in a very short time. One of the benefits of the ICB courses is that the qualifications you will receive are recognised qualifications. This means that employers all over South Africa will recognise your qualification. What’s even better is that ICB courses are also internationally recognised. That makes your employment options even greater. The fact is that the requirements depend on the course and the college where you choose to do the course. Some colleges require you to have finished Grade 12, while others might even require as little as Grade 10. With so many courses are out there it can be difficult to decide what the best choice, of course, will be for you. Do They all Have the Same Entry Requirements? No. Every course you can find will have different requirements. This is because they are offered by different colleges and the courses focus on different things. The entry requirements depend on the intended outcome of a course. The ICB courses also have their own requirements. This is the first of the three ICB Office Administration courses. To enter this course you will need to have at least completed Grade 12. You also need to be at least 16 years old. During this course you will also learn some bookkeeping skills, however, you don’t need to have any prior accounting knowledge to study this course. This course is 18-months long. This is the second ICB course in the field of Office Administration. You need to have finished the ICB Certificate: Office Administration before you can do this intermediate level course. The duration of this course is nine months. The final ICB course in the field of Office Management. To study this course you will need to have finished the ICB Higher Certificate: Office Administration. This course also takes nine months to complete. The ICB is an internationally recognised organisation. This means that your qualifications are internationally recognised by employers and learning institutions worldwide. These courses also give you a very high quality of education. You could also register with the Chartered Institute of Management Accountants (CIMA) or Association of Chartered Certified Accountants (ACCA) once you have completed one of the finance-focused ICB courses. Are you interested in studying an ICB Office Management course but want more information? You can find more information about the ICB courses on this page. If you are ready to get started you can call us toll-free on 0800 39 00 27 and one of our course consultants will call you back to help you register today!